Thank you so much to everyone who made our 6th Annual Action Speaks Louder Than Pink – Food for Thought fundraiser on Wednesday such a success. Whether you were a guest, volunteer, or joined us in spirit, it was a powerful evening because of all of YOU! Our work is possible because of you. There is no other organization doing the work we are doing, grounded in social justice and uncompromised by corporate donors. Thank you so much for supporting Breast Cancer Action and investing in social change. Thank you to our fabulous emcees, Davia Nelson & Nikki Silva (aka The Kitchen Sisters) for guiding us through the event’s program. Many thanks to the generous and talented chefs for preparing the scrumptious four-course dinner: Jonathan Sutton and Tony Ferrari from Hillside Supper Club, Bronson Macomber from Prosper, Charlie Ayers from Calafia, Bernard Hong from Café Madeleine, and Chef Sascha Weiss for his role as lead chef. If you couldn’t be with us on Wednesday, it’s not too late to support our work! Your fully tax-deductible donation will help us get to our $40,000 goal. We’re so close and with your help we can get there. 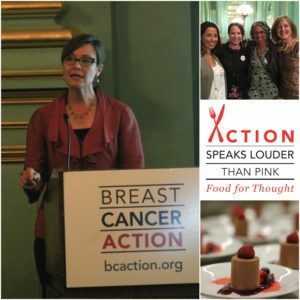 At Breast Cancer Action, we have a strict conflict of interest policy: we refuse corporate funding from any company that profits from or contributes to breast cancer. Nearly 75% of our funding comes from people like you, and grassroots events like this are critical to funding our activism for women’s health. Here are some photos from the event (thank you to Angela Bennett, our wonderful volunteer photographer)! And don’t miss the powerful video we watched together.